On behalf of the Organizing Committee and Japan Chapter, I wish to extend our heartfelt appreciation for the full support and cooperation all the ISSAAS chapters to the success of the ISSAAS International Congress 2014 held at Tokyo University of Agriculture. We are happy to inform you that there were a total 350 participants including 50-60 Tokyo NODAI Students and Professors who participated as audience and staffs. About 240 papers have been presented in the two-day scientific meeting from seven themes. Please also accept our apologies if we have caused any inconveniences to you and/or your chapter members. We hope that these would not discourage you or your members in participating to the next ISSAAS Congress. The 21th ISSAAS international congress will be held in Tokyo from November 7 to 9, 2015. We are looking forward to seeing you again in Tokyo next year. The abstract submission deadline was September 15, 2014. We do not accommodate late submissions. In case you missed the deadline, you are most welcome to attend next year’s congress in Japan. The congress tour is scheduled on November 10, 2014 (Monday). With the overwhelming number of participants, tour itinerary is now being subjected to changes. New itinerary will be announced later. For those who wish to join the congress tour, you are kindly requested to fill-in and submit the attached congress tour form and send to issaas14@nodai.ac.jp on or before 8 October 2014, with subject heading Congress Tour. Only those who have paid the registration fee can join the congress tour. The submission deadline for the ISSAAS International Congress 2014 is just less than a week from now. You are all invited to submit on or before September 15, 2014. Abstracts can be sent via email to issaas14@nodai.ac.jp with the subject heading Abstract for 2014 ISSAAS, with the registration form attached. The Committee on Paper Presentation reserves the right to decide on the final form of presentation. The presenters will be advised via email on the acceptance of their paper submissions by October 1, 2014. Accepted abstracts will be published in the Conference Proceedings. Since only active ISSAAS members may present a scientific paper or poster, kindly update your membership at your respective chapters in advance. The organizing committee will request a list of active members from each chapter before the congress program is finalized. All inquiries regarding paper submissions may be directed to the ISSAAS Congress Secretariat at issaas14@nodai.ac.jp. Notices: (1) Posters should not have been presented in any scientific meeting. (2) Papers should present the results of an original unpublished research. (3) As top author, a member may only present one scientific research in the form of paper(oral) or poster presentation. (4) The organizing committee reserves the right to remove accepted paper or poster for non-payment of registration fee and/or inactive membership. The organizing committee has made a special registration for family members of ISSAAS members attending the International Congress and General Meeting. The special registration fee is 10,000 yen. This includes lunch, dinner and coffee breaks for November 8 and 9, and congress tour on November 10. Children aged 3 years old and below are free of charge, but no seat will be provided during the tour. Registration fee includes lunch, dinner and coffee breaks for November 8 and 9, and congress tour on November 10. Please be informed that there is no refund of registration fee. **Payment of registration fee through PAYPAL is the only mode of payment available. You can sent your registration form to issaas14@nodai.ac.jp with subject heading "registration pay on-site". You can get visa documents soon. Then we will accept your registration officially after confirmation of your membership in your chapter on Sept. 15. RIKEN is Japan's largest comprehensive research institution renowned for high-quality research in a diverse range of scientific disciplines. The RIKEN gallery displays highlights of past and latest research in the exhibit space. Displays include RIKEN’s history and explanations of cutting-edge research achievements in physics, chemistry, engineering, bioscience and medicine. This museum provides a wide range of information about naturally brewed Kikkoman Soy Sauce, including the history of soy sauce, details about its production process and features of soy sauce, together with recommended recipes. A tour walking around and looking at the modern massive factories in process is arranged with English guides. Goyogura, in the same premise, was built to produce soy sauce exclusively for the Imperial Household, and it has continued to produce soy sauce by using wooden vats and original equipment. 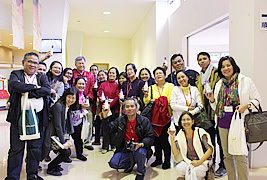 Looking around Goyogura together with the Museum, visitors may become familiar with soy sauce and its production. Asakusa is a district at the center of Tokyo, where an atmosphere of past decades survives. Asakusa's main attraction is Sensoji, a very popular Buddhist temple, built in the 7th century. The temple is approached via the Nakamise, a shopping street that has been providing temple visitors with a variety of traditional, local snacks and tourist souvenirs for centuries. 1 Tour itinerary is subject to change due to weather, traffic conditions and others factors beyond our control. 2 Although lunch will be provided, there are no special arrangements made for participants with dietary restrictions related to religious or medical reasons, and such participants are requested to bring their own food. 3 For those who wish to enjoy Tokyo more and go back to the hotel on their own, there is an option to leave the tour group at Asakusa from 16:00 before the tour group leaves for Tokyo NODAI. 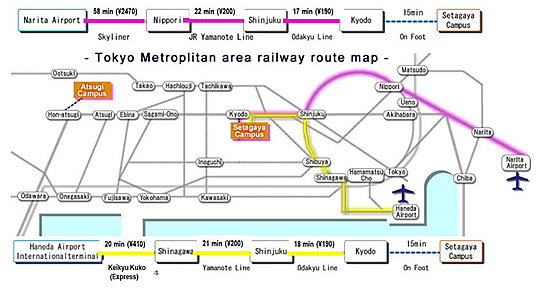 For other means of transportation to Central Tokyo (especially Shinjuku and Shibuya stations), you may also check the websites of Limousine Bus (http://www.limousinebus.co.jp/en/) and Narita Express (http://www.jreast.co.jp/e/nex/). In case you need assistance regarding train routes, kindly check Jorudan Norikai Annai (http://world.jorudan.co.jp/norikae/cgi-bin/engkeyin.cgi). There will be no airport/hotel/venue transfer arrangements. The International Society for Southeast Asian Agricultural Sciences was established in 1994 to strengthen cooperation among agricultural scientists in Asia, particularly Southeast Asia, and to bring together groups of professionals from many different countries with common interests in agricultural development in the region. In the 20 years since its founding, ISSAAS member scientists have made great strides on the regional and world stage through their contributions to agricultural science and rural development. Many countries and universities have also gained valuable experience from the practice of holding annual ISSAAS International conferences all around the region, specifically in Indonesia, Japan, Malaysia, Philippines, Thailand and Vietnam. 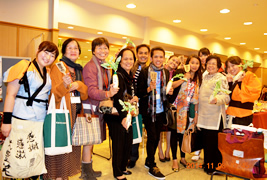 Tokyo University of Agriculture is therefore particularly honored to host the 2014 ISSAAS International Congress in this year, the society’s 20th Founding Anniversary. To celebrate these two decades of remarkable scientific and technological achievement and contribution by ISSAAS in various fields of expertise, the theme for this year’s congress is AGRICULTURAL CHANGES IN SOUTHEAST ASIA: Past, Present and Future. Our hope is that the ISSAAS members will undertake critical evaluation of problems and achievements of the past, evidence-based focus on current situations and outstanding issues, and point the way forward to a vision for the agricultural vitality and ecological sustainability of the region. Abstracts shall be written in English, not exceeding 250 words. Manuscript should be prepared on A4 size paper; single spaced and Arial font size 11 in Microsoft Word format. The top of the page shall contain the title of the paper in bold capital letters, as well as the name of the author(s) and their affiliations, and the email address of the corresponding author all centered on the page width. Oral presentation and discussion is limited to 15 minutes. Posters should conform to the following format: (a) 30” x 40” size, (b) orientation – portrait layout; (c) material – tarpaulin or heavy coated paper; (d) color mix – shall fit to a light display background; and (e) content layout – freestyle. The general content shall include: (a) Title; Researcher/s Name and Institutional Affiliation; (b) Introduction; (c) Materials and Methods; (d) Results and Discussion; (e) Conclusions and Recommendations; (f) Literature Cited; and (g) Acknowledgements. Deadline for Submission of abstracts is September 15, 2014. Abstracts can be sent by email to issaas14@nodai.ac.jp with the subject heading Abstract for 2014 ISSAAS, attached with the registration form and receipt of registration payment. Kindly download the registration form from the ISSAAS Congress 2014 website (http://www.nodai.ac.jp/issaas/issaas2014). Since only active ISSAAS members may present a scientific paper or poster, kindly confirm your membership at your respective chapters in advance. The Committee on Paper Presentation reserves the right to decide on the final form of presentation. The presenters will be advised by email on the acceptance of their paper submissions by October 1, 2014 at the latest. Accepted oral presenters are kindly requested to convert their Powerpoint presentations to Adobe PDF with file name (Last and First Name of Main Author and Date of Submission. Example: Nodai.Tarou-2014.10.15.pdf) and submit to issaas14@nodai.ac.jp before October 15, 2015 with subject heading PDF for 2014 ISSAAS. Accepted abstracts will be published in the Conference Proceedings. All inquiries regarding paper submissions may be directed to the ISSAAS Congress Secretariat at issaas14@nodai.ac.jp. The registration fee is 15,000 yen for both local and international members, 10,000 yen for student members and 20,000 yen for non-members. This includes lunch, dinner and coffee breaks for November 8 and 9, Congress Tour on November 10 and conference kit. Although meals will be provided, there are no special arrangements made for participants with dietary restrictions related to religious or medical reasons, and such participants are requested to bring their own food. For those who will be member participant only, kindly send the registration form with the subject heading Registration for 2014 ISSAAS. Kindly visit the ISSAAS Congress 2014 Webpage (http://www.nodai.ac.jp/issaas/issaas2014) for the registration fee payment via Paypal. On-site registration is also available. *Tokyo University of Agriculture will not provide airport and hotel pick-up services, so we request everyone to come to the venue on their own. 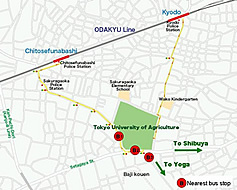 Please find the list of available accommodation facilities near and within Tokyo University of Agriculture (Setagaya Campus). The above room rates per night are available for the duration of stay within November 7 at 2pm (Earliest Check In) and November 11 at 12 nn (Latest Check Out). For those who wish to book a room, kindly submit the reservation form to issaas14@nodai.ac.jp with subject heading Room Reservation. Due to limited number of rooms, reservations will be done on first come first served basis and only those who have paid the registration fee will be given priority. Please be advised that only cash payment in yen for university accommodation, and cash in yen and credit card payment for Tokyu Stay Yoga are available upon check in. Kindly download the room reservation form from the ISSAAS Congress 2014 website (http://www.nodai.ac.jp/issaas/issaas2014). or visit the ISSAAS Congress website (http://www.nodai.ac.jp/issaas/issaas2014).